Dzien dobrie, everyone! We’ve finally settled down long enough for a blog post! 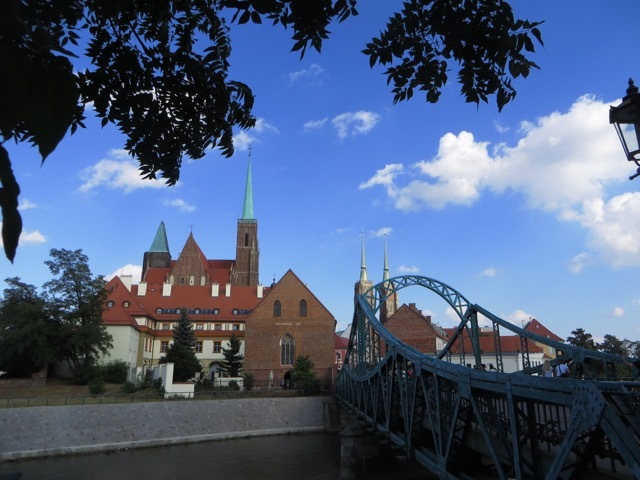 First of all, Wroclaw is a beautiful, friendly city and we’re happy and feel lucky to be here. We’ve been busy getting settled in and starting a new school year, and getting the hang of life in our new city. It has been been a few months already, but it feels like only a few days have passed. Here is a bit to give you a feel for our new neighborhood, home, and school. We get a monthly budget for housing and we could have chosen an apartment left by a departing teacher, but we struck out on our own and are very happy with what we found. It’s a modern apartment in a brand new building, but nestled into a quaint old neighborhood – the best of both worlds! We didn’t find a two bedroom apartment, but the living room has a full sized bed, a wardrobe, a door, and patio access so when you come to stay it will be your room. We have tons of storage space and every cupboard is covered in panels that pop out. All the appliances are new and sparkly! Our cats – especially Ching – are enjoying the patio and sofa, and there are plenty of nooks for Clark to hide in. 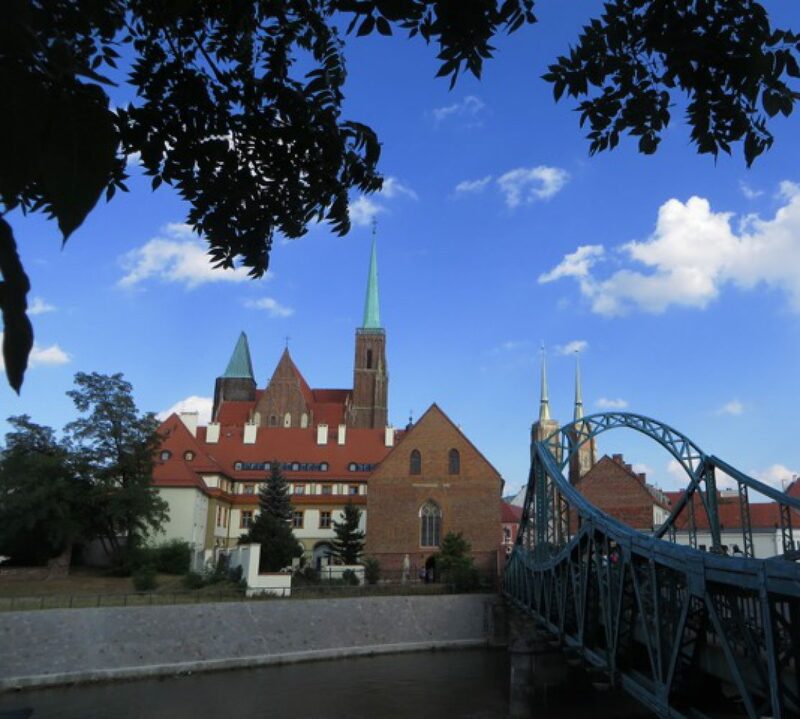 We also love the patio and the view of our neighborhood – we can even see the spires of the old gothic churches that are all over the old city. 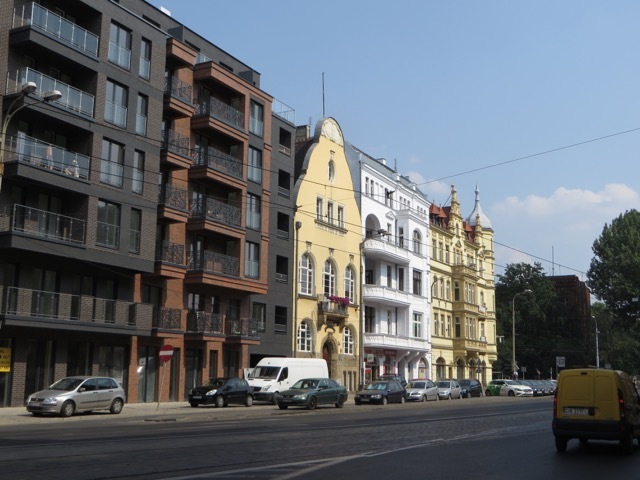 Our neighborhood is a mixture of modern and very old buildings. It evokes a romantic spirit but also suggests a bright future. Lots of things are happening in our neighborhood. A new headquarters for 3M is right next door. Ongoing gentrification turns older, crumbling facades into beautiful storefronts with charming restaurants and bars. And last year Stephen Spielberg filmed a movie on our block, the film – Bridge of Spies, starring Tom Hanks – was released in November. We’re very close to the center of town, the old markets, and parks on islands in the river. Lastly, we are surrounded by tram lines and bike lanes. We have found it easy to get around by hopping on the tram. It takes Akasha 24 minutes to take the tram to work and about 35 to ride her bike. While we are on a quiet street we are near cafes, art galleries, and some beautiful murals. We have meant to go to more festivals and events but we’ve been having so much fun just exploring the twisty streets around us. We hope you’re able to come and visit soon.